After my 12 years of service in the general government, according to my dream to have experience in the two houses of Kairos and Genesis, with discernment with the newly elected Superior general, sr. M. Micaela Monetti, the decision was made. I reached Guadalajara towards the end of November 2017 and the sisters over there were very welcoming and I felt quiet at home, although Mexico is not a new place for me. I studied the language Spanish and then I joined the therapeutic equip of Kairos for weekly session. At the same time I was also fortunate to attend all sessions and observe everything. As we or most of us know the program of Kairos is for all the women consecrated lasting three and half months and Genesis for the Priests who are looking for a heart of metanoia. Both the programs are unique in the Congregation. It is good to congratulate the Mexican province for continuously promoting it, also with the help of external professional equip of professors. Having had the opportunity of experiencing and witnessing how the individual come, how they work personally and how they go back to their respective ministry, gave me lot of joy, conviction and hope. Joy because I witnessed the change, conviction because there is a possibility for change and hope for I believe that the life of the individual is a grace and consolation for all those in contact with that person in the future. These both programs can be compared to a tree that is leaning! We know most gardeners want the trees in their yard to grow straight and tall, but sometimes Mother Nature has other ideas. Storms, wind, snow and rain can cause a great deal of damage to the trees in our yard. When we love the tree and desire its healthiness there is an occasion to straighten it from falling in a storm. This course offers such contents and practical experiences so that the tree is firmly rooted. But the collaboration of individual through self-knowledge and hard work is to be acknowledged. Every human being is created with Freedom and there are two roads to freedom. As I reflect more deeply on the first chapter of Genesis 1.26-31 “that God created each one of us according to his own image and likeness and he BLESSED them”, I pray that, may we constantly preserve this icon. I thank the Lord Almighty for this experience of exodus that I went through from Rome-India – Guadalajara. And now back to India after almost 13 years! I thank the Superior General for manifesting her enthusiasm for my missionary experience; I thank Sr Rose Mary the provincial superior of India and her team for supporting me in many ways. My gratitude goes to the province of Mexico, the provincial superior and her team, and the sisters of three communities where I had been. 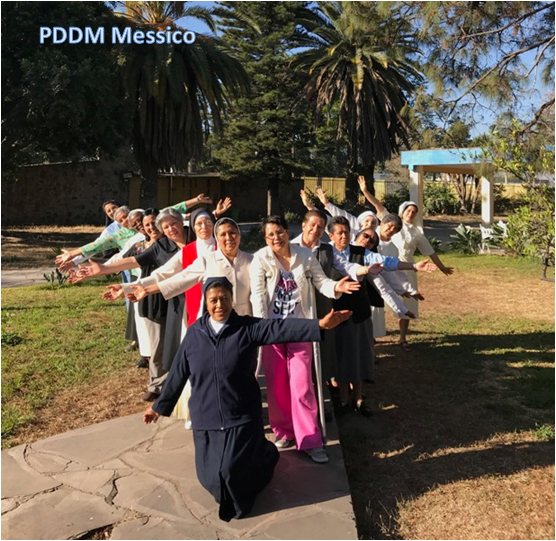 May God continue to bless the Province of Mexico, our Congregation and bless every Pddm with openness of mind and heart. May He provide for us the grace to come out of our self- reference to offer everyone the life of Jesus Christ through our Eucharistic, Priestly and Liturgical mission (RL.9).